Polaris evolution is a highly flexible, scalable, modular audio mixing system based on Ethernet connectivity, which allows multiple tasks to be performed simultaneously. Each user interface can be personalised to an unprecedented degree to suit personal preferences or the task in hand. User interface options include control from tablets and other mobile devices. Software modules are available to optimise the system for use in live sound, theatre and post production or broadcast applications. The Stagetec NEXUS routing matrix may form part of a Polaris evolution system; NEXUS is fully modular and can be configured with whatever mix of audio I/O formats is needed. The Polaris evolution from Salzbrenner represents a radical development in the concept of audio mixing. Recognising the increasing standardisation of MADI as an audio transport format in broadcast, post production, theatre and live sound applications, it combines hardware and software elements to provide users with precisely the control facilities they need, where they need them, with minimal connectivity issues. 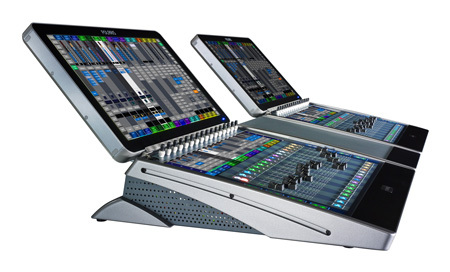 The Polaris evolution system comprises three primary hardware components: the access 16-fader control surface, the view multi-purpose touch screen and the scala DSP frame. The scala DSP frame is a 3U 19” rackmounting unit: as well as the DSP core, it provides a 256 x 256 routing matrix and card slots to accommodate optical MADI I/O ports. In facilities where MADI is the standard audio transport format, no additional I/O hardware is required. However, analogue and digital inputs and outputs may be added at will by the addition of a Stagetec NEXUS audio routing system (see separate website entry), which can be configured with any combination of analogue (mic or line), AES3, HD SDI, DANTE or further MADI I/O modules. Two scala modules may be cascaded to add a further 384 inputs, resulting in a system mix architecture of 640 into 256. Furthermore, scala units may be duplicated at network level to provide a fully redundant system. scala communicates with the control surface components using IP over Ethernet; connections are via standard Cat 6 cable and IT architecture. The access console is a 16-fader control surface; multiple access consoles may be physically interconnected to provide a larger surface if one is required; an inter-module script area is also available. As well as 16 motorised faders, each access is fitted with 16 dual concentric rotary encoders, 48 recessed, illuminated push buttons and a full-width, multi-purpose touch-sensitive display. The user can choose the channel parameters to be displayed – input levels, EQ curve, send levels, etc. The dual encoders are “soft” and their function assigned according to the currently displayed parameters. Local I/O may be added to provide talkback and headphone monitoring, using Dante™ as the audio transport format: a Dante™ client card is fitted as standard and communicates with an optional Dante™ card in scala. A view module, consisting of a 21.5” touch screen, may be added to any access console to greatly increase the amount of information that can be displayed. view is attached to the rear of access, and is motorised, to optimise the viewing angle to suit operator and ambient lighting conditions. view has its own powerful internal processor, to permit it to be used as a stand-alone module. Polaris evolution systems are supplied as standard with a Live software module, which provides a wide range of standard mixing console features, including per-channel 6-band EQ, delay, dynamics and de-essing, plus multiple PFL/Solo busses, VCA and Mute groups, and EQ, dynamics and effects processing per-bus. Extension software modules for Theatre and Post Production, and for Broadcast applications are also available, which add further mixer features relevant to these types of task, such as scene-based automation, N-1 outputs and surround sound capability. Control of audio in a Polaris evolution system is not limited to the dedicated hardware control surfaces; being a network-based system, it is compatible with tablet PCs and other mobile devices via WiFi.